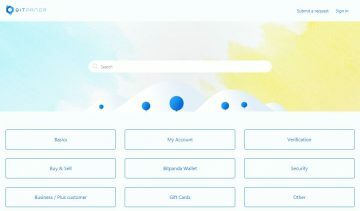 Bitpanda.com Review 2019 – Scam or Not? Bitpanda.com or previously known as Coinmal is a cryptocurrency exchange website that provides easy services for people that want to get into the crypto world. Today, we will be looking into what their website is all about in general. We will try and create an account with them, know their limitations and verification levels, features, and show you their exchange platform. Due to the number of exchange websites that operate today, it is not a shocker that people read about the website in advance if you plan on creating an account with them. Without further delay, let’s dive into Bitpanda’s website and talk about that! A good review would always include a few words about the background of the company to ensure full disclosure to people that want to create an account with them. Of course, by the end of the day, it is still your decision to either create an account with them or not, but shedding light on company information and background can be of great use. The website Bitpanda.com is owned by Coinimal GmbH, which is based in Austria and has been operating since 2014. When it comes to Bitpanda’s licensing, nothing is mentioned on their website about the specifics and they’re “About Us” page only says something between the lines of “we work closely with the local authorities” but no once the word “license” has been mentioned. But no need to be alarmed, there is a lot of exchange website today that are not licensed but have a good reputation to back them up. Since the year the website was launched, we haven’t heard about any major issues with the website that would lead people away from them. In addition, there haven’t been any reports of the website being hacked previously, which is always a plus! Now that we’ve talked about their company, why not try to create an account with them and see if they have verification levels. There are a handful of exchange websites today that provide different levels of verification depending on how much information you submit to them; is Bitpanda one of those websites? To create an account, we, of course, need to go to their website and click on the “Sign Up” button located on the upper right-hand side of the website. To register, you only need to have an active email address and you’re good to go! There’s a note saying that customers from around the world are able to sell BTC on their website and that customers from Europe are able to buy at the same time. Does this mean that it only goes one way? Or does the website accept sellers from Europe as well? Once the active email is provided and you submit the request, a confirmation email will be sent for you to click on it. You will then be redirected back to their website to provide a password with at least 10 characters and contains at least one uppercase letter, one lowercase letter, and one number. After providing all the primary information, you can then log into your account. After creating an account, you will then be able to see their verification levels. An unverified account is called a Starter account wherein you will have no access to buying/deposit services on the website. This means that online payments for deposits will not work. But this doesn’t matter if you are only planning to sell BTC on the website since you will still be able to transact by selling/withdrawing money from your account. The daily sell/withdraw limit for a Standard account is EUR 1,000 and EUR 7,500 per month. What if you want to get out of the standard account? What do you need to do? These are the steps required below to level up your account tier. Bronze – To level up your account to bronze you need to provide your mobile number along with your international country code. Once this has been provided on the website you will then receive an SMS for the 6-Digit PIN that you will need to enter on Bitpanda.com. Silver – To level up your account from bronze to silver, you first need to have your account verified for bronze. Once you already have a bronze account, proof of your physical address is needed to get verified with the silver tier. Gold – The last and highest level of verification requires applicants to engage in a 3 to 5-minute video call between yourself and a trained professional that will be validating your identity. Please be advised that before going into the final verification level, you need to make sure that you have a camera, microphone, and stable internet connection. This can be done on either a mobile device or on a computer. 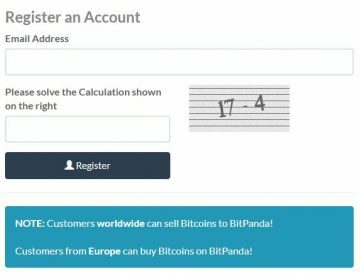 Getting your account verified here at Bitpanda.com will increase your daily purchase and deposit limits drastically. So if you think that having a regular standard account with the website is not enough, then why not try and have your account verified? You can read more about the verification details through your account dashboard and by clicking the “Verification” tab located on the left panel. One of the features that completely ties up with what is called a “perfect” exchange website is having a Two-Factor Authentication feature installed. Surprisingly enough, there are a couple of exchange websites that do not have this feature for their customers. Aside from their 2FA security feature, they also offer something called “Bitpanda To Go” vouchers which can be purchased in post offices all throughout Austria in 50, 100, and 500 EUR denominations. Once you have purchased a Bitpanda code, just simply log into your account and click the “Bitpanda to go” tab located on the left-hand side panel. Referral Bonuses – The website also offers a referral program for people that invite their friends to create an account with Bitpanda.com and have them verify their accounts up to gold tier. For a successful verification and after the initial order, you get to bank EUR 2.50 per referral. Not only that, aside from the initial referral bonus, you also get additional 5% lifetime bonus on all your referral’s collective service fee. Read more about this awesome feature here. We’re sure that you guys have been wondering how it all goes down for trading in Bitpanda.com! Here at Bitpanda, they act as a straight exchange website where you do not need to think about the candlesticks and hoping to get your order matched, you just log into your account and buy or sell crypto. 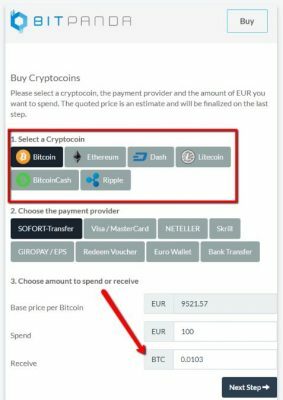 Shown on the screenshot is how you purchase BTC, ETH, DASH, LTC, BCH, and XRP. On the Buy and Sell tabs, you will be able to select which crypto you want to purchase then the payment provider for purchasing and the amount you will need and receiving will be calculated automatically depending on the current exchange price of the website. It’s actually really surprising to see how easy it is to use their exchange platform. It is both informative and designed properly to avoid confusion when purchasing/selling crypto online. We would like to remind you guys that since this is a straightforward exchange website, they would have a very different exchange price from the world market. There are no fees being listed on their website, which means that everything is already added to their exchange price. If you guys have an account with Bitpanda.com and know what their fees are in percentage please do let us know in the comment section below. 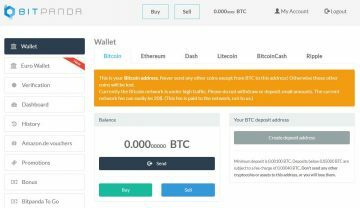 If you plan to purchase any of the mentioned crypto above (BTC, ETCH, DASH, LTC, BCH, XRP) then you can do so through Bitpanda.com with the use of SOFORT-Transfer, Visa/MasterCard, Neteller, Skrill, GIROPAY/EPS, Voucher, Euro Wallet, and Bank Transfer. Please be advised that bank transfers are only available under the “EUR Wallet” tab. If you plan to use the advantage of having a larger audience for you to sell your crypto then Bitpanda can be that website that you have been looking for. Available payout options include Euro Wallet, Bank Transfer, Amazon.de Voucher Code, Skrill, and of course, Neteller. What they’ve done here is a step above the rest of the exchange platforms today. 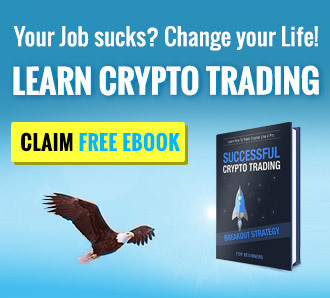 If you want to trade crypto against Fiat, then this website is not for you. Their purchase and payout options are different since you are straightforward buying or selling crypto for Fiat. What’s funny is that the website doesn’t have any customer service button (maybe we missed it) for us to show you guys what they have in case you want to contact them. We have stressed how important customer service is in our previous reviews and this is definitely not an exception. When we clicked on their “Contact Us” button it did nothing at all and did not redirect us to their information page. This means that we do not have any idea on how to contact them! What we have are links to their Facebook, Twitter, Reddit, and Bitcointalk.org accounts and threads. We encourage you guys to read their Bitcointalk thread since there are a few things out there that you might want to know more about; especially the recent thread replies. 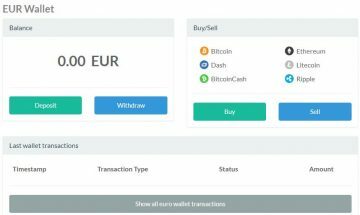 If you are from Europe and you want to get access to BTC and some of the other major crypto coins, then you might want to check this website out. They are geared towards providing services to the EU region and have been doing great with it. What caught our attention is that here at Bitpanda.com it is really easy to purchase/sell crypto and since there’s no real trading platform, it wouldn’t take you that much time to just simply log in, and transact with them. We do have a few things that we wish they would change in the future and this includes their fees being listed as well as register the website as a regulated one to attract more customers. Their customer service is virtually non-existent and is honestly not a good sign. We strongly suggest you guys read more about the website before committing to depositing money into them. Have you guys experienced their services? Please do let us know in the comment section below!